Planning A Fall Or Winter Themed Wedding Or Celebration? Also Perfect As Favors To Thank Your Guests! 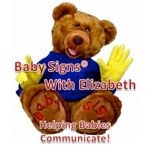 Contact One Of Our Design Consultants For More Great Decor Ideas! 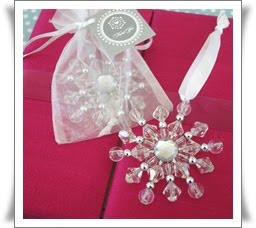 Beaded Snowflake Decor - Beautiful To Hang On Your Centerpieces Or Around Your Venue For A Glistening Winter Wonderland. 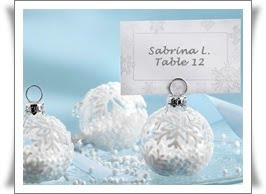 We love these ornaments for a Winter Or Holiday Themed Event! Each holds your guests' seating assignments in a stuning display while doubling as a beautiful thank you gift they're sure to use again and again. Perfect to use to add candlelight to your reception tables! 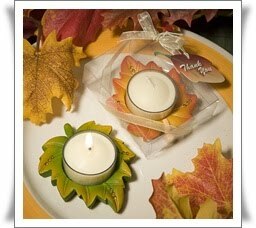 Includes a tealight candle set in an autumn leaf holder accented with topaz rhinestones. Each arrives gift boxed with a thank you tag to use as a party favor as well.